BEFORE: The film du jour will be yet another Coen brothers film, Barton Fink. The film stars a few Coen regulars, John Goodman (last seen in Raising Arizona), Steve Buscemi (last seen in Fargo), and John Turturro (who is new to the marathon). AFTER: I don’t remember much of what happened in Samuel Beckett’s play Waiting for Godot but what I do remember truly can be summed up in the oft heard “The whole play they wait for Godot and he never shows up”. The important thing is not that deep and meaningful stuff is most likely discussed in the play but that it’s not memorable. All you remember is that they wait for nothing. Barton Fink reminds me a lot of Waiting for Godot. First of all, the writing gives off a play vibe. In terms of other films, Barton Fink reminded me a lot of The Big Kahuna and Glengarry Glen Ross, both of which are actually adapted from plays. The difference with Barton Fink is that it was written by the Coen brothers for the screen yet still retains that play style. Personally, I’m not that big of a fan of plays but then again I’ve only seen a handful in my lifetime and all were required for school which probably diminished my appreciation for them, but I’m not that big of a fan. Not being a theater person I can’t critique this film from that perspective because I don’t know the ins-and-outs of the medium. All I know is how to critique it from a film perspective. Coming from a film perspective, Barton Fink seems very exaggerated in terms of both acting and production design. In the middle things seemed to mellow out a bit but at the bookends of the film there was some crazy stuff going on. At times it even borders on unrealistic (the final scene in the hotel comes to mind). And when things are not overly exaggerated, it feels as though nothing is happening. Not just the action toned down to a “normal” level but literally nothing. Just Barton Fink (John Turturro) starring at items in his room and then the reverse shot of his reaction. While it’s pretty clear I don’t like Barton Fink I think a lot of that has to do with the style and tone of the film more than the story. As per usual, and has been the case the last couple days, the constant throughout the Coen brothers films is the strong story. 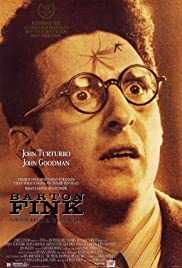 With Barton Fink, I’m not a fan of the details or the execution, but as an overall idea I think there is promise to it. (Especially at the end when John Goodman’s character takes on a larger role.) If you like plays or more bizarre occurrences, Barton Fink would be a good pick. For myself however, the brothers’ fourth outing isn’t that big of a success.